Red Sox closer Craig Kimbrel. @RedSox. The Yankees nearly made up a five-run deficit on Friday night at Fenway Park, but Red Sox closer Craig Kimbrel closed them out in a 5-4 Boston victory. It didn't take long for the Red Sox to get to Yankees starter J.A. Happ, who pitched well against Boston in the regular season. J.D. Martinez hit a three-run hoer to left field that just cleared the Green Monster. After Happ retired Boston in order in the second, Boston was back at it in the third, as Mookie Betts doubled to deep center, followed by Andrew Benintendi reaching on a bunt single. That was all for Happ, and in came Chad Green out of the bullpen. Green gave up a dingle to Steve Pearce to make it 4-0, then Martinez hit what looked like a possible three-run homer, but it fell short at the warning track. Xander Bogaerts followed with a sacrifice fly to make it 5-0 Boston, but it could have been far worse. Both runs in the third were charged to Happ. Starting with Green (2 innings), Lance Lynn (2 IP), Zach Britton (1 IP), and David Robertson (1 IP), the Yankees bullpen held Boston scoreless the rest of the way. Yankees Manager Aaron Boone said of Happ and the bullpen responding, "Yeah, J.A. obviously got in a little bit of trouble in that first inning, just not having his real airtight command that he usually has, especially with the fastball. Obviously J.D. made him pay on a pitch down that he probably wanted to get a little more elevated there. And then being at the score and where we're at we were a little aggressive going to our pen. The pen did a great job to allow us to get back in the game and give us a chance, and we almost caught them." Boston starter Chris Sale was sailing along until the fourth when Aaron Hicks and Didi Gregorius reached on singles, but he responded with a strike out of Miguel Andujar to get out of it. Hicks was lifted right after his hit because it appeared that he re-aggravated the hamstring injury he suffered in the last week of the regular season. Brett Gardner took his spot in the lineup. Boone said of Hicks' injury, "He had some tightness in that hamstring. So he'll get examined further tomorrow, and have an MRI and everything. He felt like it might have been cramping, so we'll just have to see. I haven't personally spoken to him yet since he's come out of the game. Hopefully we'll have a clearer picture tomorrow when he gets up and we get some pictures, too." Sale retired the Yankees in order in the fifth, but in the sixth, he gave up a single to Aaron Judge, followed by a Gardner forceout, and then an line drive from Giancarlo Stanton. That was all for Sale, as his pitch count got up there, at 93 pitches, with 61 strikes. First out of the Boston bullpen was Ryan Brasier, who gave up an RBI single to Luke Voit and another run came in on a Gregorius fielder's choice that made it 5-2 Boston. Brasier walked Andujar, and that was all for him. Brandon Workman came in next, and he walked Gary Sanchez to load the bases. Gleyber Torres was up with a golden opportunity to tie it or give the Yankees the lead, but he struck out to end the threat. The Yankees did keep their momentum going in the seventh, as Andrew McCutchen and Judge got singles, and that knocked Workman out. Matt Barnes was next out of the Boston 'pen, and he walked Gardner to load the bases. He then struck out Stanton, got Voit to ground into a fielder's choice to bring in a run and make it 5-3, and he got out of it by getting Gregorius to ground out to second. Boston turned to starter Rick Porcello in the eighth, and he got Andujar to ground back to him for the first out, got Sanchez on a liner to third, but then Torres reached on a dribbler to third base. With two outs and McCutchen coming up, Boston turned to their closer, Craig Kimbrel. After a six-pitch battle, Kimbrel got McCutchen to fly out to right to end the eighth inning. Kimbrel stayed on for the ninth, in which the Yankees brought the heart of their order to the plate. Judge was up first and he hit a bomb into the bullpens in right for a solo homer to pull the Yankees within a run, 5-4. Kimbrel then proceeded to strike out Gardner on a rising fastball away that had a tail on it, followed by a strikeout of Stanton on three straight pitches in the same spot on the outside corner (breaking ball-fastball-breaking ball), and then fanning Voit on a fastball right down the heart of the strike zone to end it. The Yankees dug themselves a hole, but by getting Sale out of there with one out in the sixth, they gave themselves a real chance to win the game against a shaky Boston bullpen. The Sox held on to win this one by a run, winning the opening game of not just the first Division Series between the clubs, but the first time Boston has home field in a playoff series with the Yankees. 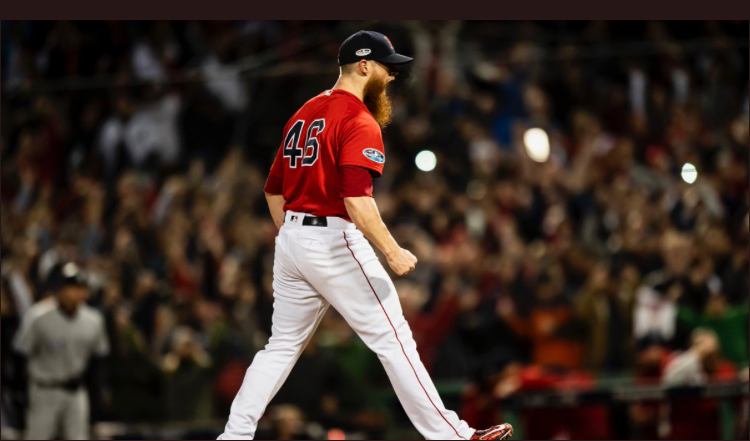 Q. Aaron, it just felt like it was such a big switch for you guys staying alive after falling behind, to really feeling like an opportunity lost maybe towards the end of the game with the people you left on the base and the back-to-back bases loaded situation. AARON BOONE: Yeah. And you know, I do credit them a little bit in the fact that they did a good job of minimizing and staying away from trouble against us. And staying away from damage against us. But, yeah, we just couldn't get that really big hit that -- to have that big inning, that really jumped us back in the game in the middle innings. And I thought we did a really good job of pecking away, a good job of giving ourselves opportunities, and just ran out of time there. But yeah, we just couldn't get that back-breaking hit that allowed us to have that big inning. Q. Aaron, what did you think of Sale? And was it any harder to prepare for him just because he's barely pitched the last couple of months? AARON BOONE: No, I think the prep is the same and what his stuff is, you know, usually dictates how much success you can potentially have against him. So I thought he was good. You know, not his dominant self necessarily, but I thought he did a really nice job of mixing his pitches, changing speeds. His change-up, slider were a factor. He could reach back for a little bit on the heater when he really needed to. So I think he gave them a strong outing, no doubt about it. And did a good job I think of keeping us off balance enough. We were able to get his pitch count up and get him out of there, and then keep crawling back into it. But overall I thought he pitched pretty effective against us. Q. Aaron, how much of a luxury is it to have a deep bullpen like you do? And is that something you feel can be advantageous for you going forward in the series? AARON BOONE: Yeah. I mean, that's one of our ultimate strengths. You know, if we're going to get to where we want to go, you know, the bullpen is going to play a big role in that. They stepped up for us tonight, and allowed us to get back in that game. And did the job they've pretty much done all year for us. Q. Aaron, you know Alex pretty well. Were you surprised to see him make that switch and go to Porcello there late in the game? AARON BOONE: Not necessarily. I mean, we saw him warming up. Once we saw him warming up, we figured he would probably start the eighth inning. Obviously Rick has been a really good pitcher for them. And we were able to kind of work through some guys in the setup situation. So, you know, we were getting down towards the end. I don't think we were real surprised that Porcello came in. Q. Aaron, how big is Saturday's game with you guys having Tanaka? How big is it for the Yankees? AARON BOONE: Well, they are all big now. I mean, this is the playoffs. Wins are precious. You know, I think as much as it's tough any time you lose a game in the postseason, you know, I think we can take away from this game that we kind of hung around, we battled. I like the way we continued to compete and give ourselves a chance. We always feel like with Tanaka on the mound, if he's on top of his game, he can shut down anyone. So I think we'll be in a good frame of mind come to the ballpark tomorrow, and hopefully get out of here with a split. Q. Aaron, did you notice anything about Stanton's at-bats tonight? The four strikeouts in a couple of big spots. AARON BOONE: The one time I thought Barnes when -- I don't know I think he ran it full, or deep count, I thought Barnes made a great pitch against him, and just seeing the replay, where he started a tough pitch. Sometimes you know that goes with Giancarlo sometimes. If you make pitches against him, his outs are a lot of times strikeouts. So he had the hit. That was part of us scoring a run. You have to live with that sometimes. Because there's many times when you make a mistake to him in that big spot, and he can come up with the big one.